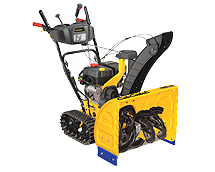 The Yard Machine Snow Thrower has a 26inch wide clearing swath with the standard 6 forward and 2 reverse gears to match all snow clearing conditions. It also comes with an electric start capability to make it easier to start the engine in cold conditions. You need to plug in a chord to an electrical outlet and press a starter to start the engine. If your engine is properly tuned, it should start on the first pull of the manual starting chord. Another feature that consumers without a lot of room will find helpful is the space saving folding handles that fold to take up less space. Once delivered your snow blower can be ready to go in minutes, just oil to the engine and gasoline to the gas tank and you are ready to go. There is also an in dash yard light to illuminate your driveway during snow clearing operations at night. Most snow blowers can be purchased with tire chains to provide extra traction in icy situations. In addition, snow shields are also a good idea. You can protect yourself from windy conditions and snow being blown back at you from the wind. The 827E Dual stage snow thrower is made by John Deere. It is a popular machine and used by many homeowners to clear snow from their yards and driveways. Please add any comments about your John Deere Snow thrower in the comments section below. Our readers will appreciate your comments. 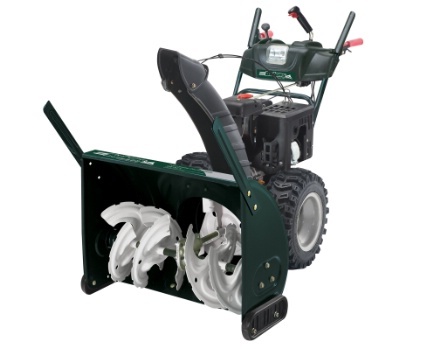 This John Deere 827E Snow Thrower started at $1099 US at the time of writing this post. This snow blower from John Deere can be bought online or in a dealer show room if you can find them. Customers should expect delivery in 3 to 7 days if ordered online. With a 27 inch cleaning width, this snow blower is ideal for most mid size driveways without being too big for storage. Storage is always something that should be considered before making your purchase. The 4 cycle Briggs & Stratton engine develops 11.5 foot pounds of torque , more than enough for all of the toughest snow conditions you can throw at it. Look for our summary of features of this 827E Dual stage John Deere Snow thrower in the next section. The warranty is 2 years for consumers and 90 days for commercial applications! The 827E Dual stage snow thrower from John Deere is a dual stage snow blower, meaning that it has an auger to grind up the snow and bring it forward into the second stage impeller. It is the impeller that actually blows the snow out the chute away from your snow clearing area. There are a number of features on the 827E Dual stage John Deere Snow thrower which make this snow blower easy to use. Features such as single hand control while you re-direct the snow chute, electric starter, headlight, tool box and clear out brush are just a few of the features that make this snow blower a pleasure to use. Delivery is usually 3 to seven days if ordered online. Consumers who purchase in store models, will need to negotiate delivery dates as well as delivery charges for the 827E Dual stage John Deere Snow thrower, however if you can pick up this snow blower chances are you will save on delivery costs as well as timing of the delivery. Some consumers may wish to have tire chains for their 827E Dual stage snow thrower from John Deere. Purchase accessories from the dealer. Tire chains are useful if you deal with a lot of ice or you have a slope to clear snow off of. Use chains on driveways with a steep slope. However care should be taken to ensure that the chains do not mark the driveway surface. They sometimes bite through the ice and snow down to the surface of the driveway. The Cub Cadet 726 TDE Snow Thrower is built for traction with a steerable track drive system that will not slip on the most difficult surfaces. Powered by a 208 cc engine and clearing 26 inches in width at a time, you will make quick work of just about any snow drift that comes across your parking lot or driveway. The clearing height is 21 inches and the snow chute comes with a 4 way pitch control and chute rotation system. There is also an in dash headlight to provide lots of light for night time snow clearing operations. This snow thrower also comes with a push button electric start system. This snow thrower may be larger than what many consumers may need to clear urban driveways, however with this machine you can make short work of any snow clear operation and have the power to deal with just about any snow drift. Steering is easy and straight forward with the use of the power steering trigger system. This snow blower is a powerful machine, treat with safety in mind! Use Snow Clearing Tool – This is the really important part. You have plugged the augers with snow, you have shut the machine off and now you are trying to clear the snow away. Never place your hands inside the augers to get at the snow. Use a broom handle if you have an old machine. Or the snow clearing tool that came with your newer machine to clear the snow. You can also purchase these tools from most stores as an extra if you break yours. Or if you have an older machine which does not have one. This is the safe way to clear snow from around the augers and the impeller. Like all snow blowers maintenance is important for your machine to operate at a peak level for many years. Change the engine oil regularly. Check the belts for tightness. Change the spark plug as required and grease any spots outlined in the manual. If you need to leave the snow blower outside all year round, cover the machine with a proper cover. This will keep it looking new and avoid deterioration of the tires and metal components. The Bolens Two Stage Snow Thrower H54LF clears 26 inches at a time with 6 gears forward and 2 reverse. The combination of the 277cc engine, the 4 way joystick for chute control and the 12 inch augers, makes this a powerful machine to clear snow from your driveway and sidewalks. Two augers are protected with shear bolts. There are a 12 inch impeller and 16 inch tires. If you get lots of snow this is just the machine for you. A yard light is included with this Bolens Two Stage Snow Thrower H54LF. Use the light for night time snow clearing. It includes drift cutters and a bottle of oil . This snow blower is ready to go within a few minutes after adding the oil and also fuel to the fuel tank. The handles fold to make it easier to store and there are extra shear bolts should you need them. This is a powerful machine and will deal with most urban snow clearing requirements. Most customers will have to arrange for delivery of their new snow blowers. They are far too big to take home in your car, so you will need a trailer, rent a van or arrange for delivery by the store that you are purchasing the snow blower from. There is a charge for this service. It will be the best way to arrange for your new snow blower to be delivered to your home. Purchase with tire chains to provide extra traction in icy situations. In addition, snow shields are also a good idea. Protect yourself from windy conditions. Also from snow being blown back at you from the wind. Purchase snow shields for most snow blowers. Icluding the Bolens Two Stage Snow Thrower H54LF. Online Reviews: We were unable to find any online reviews for the Bolens Two Stage Snow Thrower H54LF Dual Stage Snowblower, however please leave your comments at the end of this blog if you have used one of these machines. This Bolens snow blower is a powerful machine. Operate your snow blower with safety in mind. Carefully read all of the safety guidelines in the manual prior to operating the machine for the first time and follow these guidelines to ensure that both you and the machine do not have an accident. Prior to starting the Bolens Two Stage Snow Thrower H54LF the first time each day, perform a quick walk around check of the machine to ensure there are no loose parts and no leaking fluids. Check the engine oil to ensure that it is at the correct level as specified by the manual. Top up if necessary. Fill the fuel tank while the engine is cold and prior to using the machine. If you do spill fuel, wait until it has fully evaporated prior to starting the engine. Never spill fuel on a hot engine to avoid fires and always fill the fuel tank outdoors to avoid any possibility of vapors going into your house. Finally never point the chute in the direction of people, buildings or cars to avoid any possible damage and accidents. Ice can be thrown at high speed. They can cause a lot of damage. Like all snow blowers or snow throwers, maintenance is important for your machine to operate at a peak level for many years. Change the engine oil regularly. Check the belts for tightness. Change the spark plug as required and grease any spots outlined in the manual. If you need to leave the snow blower outside all year round, cover the machine with a proper cover. Keep it looking new and avoid deterioration of the tires and metal components. The John Deere Dual Stage Snow Thrower 726E is an excellent choice for most suburban owners who need a relatively small snow thrower that has sufficient power to deal with the snow that collects in your driveway. With the 205 CC engine and the 26 inch clearing width , this snow blower can make short work of clearing snow and at the same time not take too much room in your garage or shed. This John Deere Dual Stage Snow Thrower 726E comes with 6 forward gears and 2 reverse gears. It is a friction drive which is more than sufficient for dealing with your snow load. Some people prefer to use chains on the tires. Although we did not see this option, you can probably purchase chains if you have to deal with lots of ice or steep slopes. There is also a pull chord for manual start as well as 110 V electric start for those who prefer to use a push button start method. There are lots of features available on this snow blower, however some of the important areas that we would like to point out . The fresh start fuel cap is a great way to make sure that your fuel stays fresh especially when your snow thrower is not being used for a long time in the summer. It avoids the gasoline becoming stale and gumming up your carb. There is also a 180 degree remote chute rotation that allows the operator to direct the snow in any direction to avoid buildings etc. 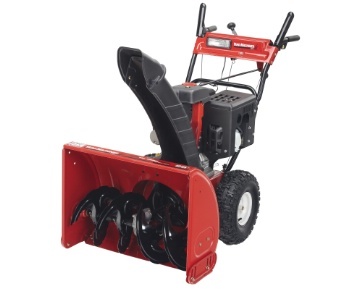 The auger and impeller are made of steel with the auger having knotched teeth to help cut into snow and ice that may build up on your driveway or snow banks. Consumers can arrange to pick up the John Deere Dual Stage Snow Thrower 726E in the store or they can arrange for delivery of the snow blower to your home usually within 5 to 7 days depending on were you live and availability of this model. Although we did not see any accessories for this snow blower, most snow blowers can accommodate a wind deflectors which protect the operator from the wind and blowing snow. Online Reviews: We were unable to find any online reviews for the John Deere Dual Stage Snow Thrower 726E, however please leave your comments at the end of this blog if you have used one of these machines. This John Deere snow blower is a powerful machine and should be treated with safety in mind. Carefully read all of the safety guidelines in the manual prior to operating the machine for the first time and follow these guidelines to ensure that both you and the machine do not have an accident. Prior to starting the John Deere Dual Stage Snow Thrower 726E the first time each day, perform a quick walk around check of the machine to ensure there are no loose parts and no leaking fluids. Check the engine oil to ensure that it is at the correct level as specified by the manual. Top up if necessary. Fill the fuel tank while the engine is cold and prior to using the machine. If you do spill fuel, wait until it has fully evaporated prior to starting the engine. Never spill fuel on a hot engine. Avoid engine fires and always fill the fuel tank outdoors to avoid any possibility of vapors going into your house.